November 9: Nikon announces safety recall of D70, D100, D50 batteries: Nikon has announced they are recalling about 700,000 EN-EL3 batteries due to possible short-circuit and overheating. Read the announcement or see if your battery is affected. Nikon recommends not using affected batteries until they are replaced. November 9: Nikon updates D2x, D2HS firmware to 1.01. Improved Autofocus & other fixes. Windows Download for D2X. Mac Download for D2X. Windows download for D2Hs, Mac download for D2Hs. November 7: DigitalPro Shooter 3-10 is now online. A full review of Dan Margulis' new must read book on color correction along with some cool new products. October 28: Microsoft releases Color Control Panel Applet: Per Microsoft, it features “on-the-fly” loading of color profile gamuts to the display (or multiple displays if you have a twin-head display adapter or dual cards), centralized management of color profiles and settings, comparison of color profiles in 3D space, and the ability to rename color profiles while keeping the internal name in sync for users of Windows XP. Download it now! Stanford's "Stanley" finished in 7-1/2 hrs. October 8, 2005: Stanley Steams to Victory! 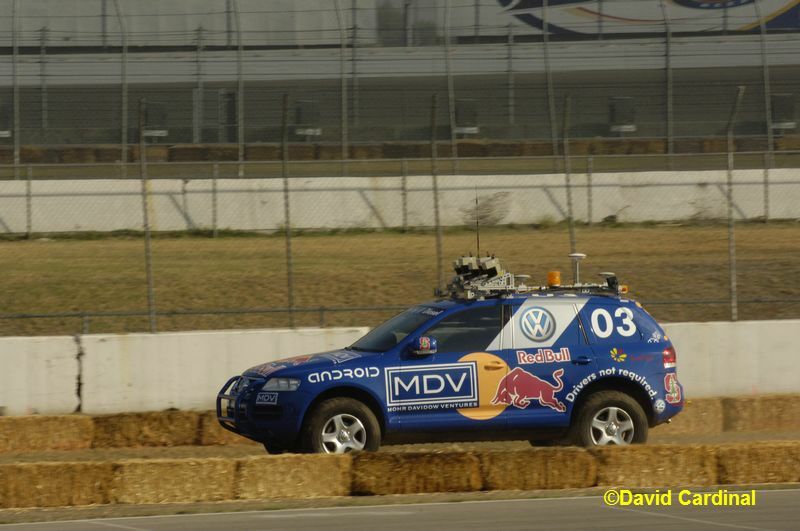 Stanford's Stanley gained ground to finish ahead of both CMU teams in DARPA's Grand Challenge. Not exactly photography, but I had a great time coming up with interesting photos covering it for my article & slideshow in PC Magazine. The Challenge pitted self-guided robotic vehicles against one another to see who could navigate 132 miles of desert first. Other teams with unique accomplishments included Princeton & Caltech whose teams of undergraduates made it over 20 miles, and team Terramax, whose full-size military truck was still chugging along on the course. Race results. Canon EOS-1D Mark II N -- available September. Updated model adds Raw+JPEG with dual card support, larger LCD, settable file prefix and Canon "Picture Style" technology. Canon EOS 5D -- available October. 12.8MP, full-frame CMOS in a lightweight, small body. 3fps with 60JPEG or 17Raw burst. Larger 2.5" LCD and Canon "Picture Style" technology. 9-point AF. 100K durable shutter. Canon Speedlite 430EX, available September. Update to 420EX with added manual mode, flash compensation and ability to manually zoom flash. 40% faster recycle & can be used as a wireless slave. August 11: Digital has come a long way! Dixon's in England has announced they will no longer be selling 35mm film cameras--declaring them a "niche" product. Perhaps we'll finally stop getting asked "gee, is digital as good as film yet?" June 12: Updated Photorescue: Now supports the Nikon D2X & Canon 350D. The only image recovery software I use & the only one you're likely to every need. Try it for free. June 9: Traveling with Digital? Looking for some quick tips on traveling with digital? You can read my article in the June 28th issue of PC Magazine online now. June 1: The Future of Raw: In DPS 3-6 we look at what Microsoft's announcement means for Raw formats and how it relates to the OpenRaw initiative and Adobe's DNG. You can read it online. June 1: SNEAK PREVIEW of Microsoft's new Raw File PowerToy (Raw Image Thumbnailer), including screenshots & analysis. supported in the PowerToy, but the Longhorn solution will have a "codec"
add support for their files. Read the full release. We've been using a pre-release of the viewer and will be reviewing it once we are allowed to talk about it. May 31: Kodak further cripples its move to digital: Discontinues DCS Pro SLR/n and DCS Pro SLR/c. Claiming it wants to concentrate on "more profitable" market segments (even though the D-SLR segment is growing at close to 1000%/year), Kodak is apparently ceasing production of its flagship D-SLRs. While consumers may still trust the Kodak brand name, their repeated fleeing from once reliable markets won't inspire confidence in most professionals looking to make long term investments. May 30: As promised Canon has released a firmware update to fix lockup problem: 1D Mark II firmware (v 1.2.2) download here and 1DS Mark II firmware (v 1.1.2) download here. May 19: Canon & Lexar to update firmware to fix image loss/corruption issues: Canon will be releasing updated firmware later this month to fix an issue which can lead to the corruption or loss of images on the 1D Mark II & 1DS Mark II (when Display is pressed before a JPEG+Raw buffer is emptied), or other Canon D-SLRs when using Lexar 80x cards. Read the Canon Announcement. May 2: Curious about Raw files? Take a peek inside a typical Raw image file and see what all the fuss is about. Exclusive article shows what raw data really "looks like." April 26: Wireless with a Twist: Nokia announces the N90 camera phone with Zeiss optics, and integrated web gallery & printing. April 25: OpenRAW initiative launched: The OpenRAW working group has officially launched both their website and an initiative to create an open, documented standard for raw files--an essential element in ensuring photographers' access to their own image data and its archivability. April 19: Raw files creating Raw nerves: The two year old spat between Nikon and Adobe has finally seethed out in public. Ever since Adobe asked for and was denied assistance for the original Camera Raw the two companies have been feuding over Raw file formats. With the D2X Nikon has taken the extreme step of encrypting the white balance "as shot" data that our cameras record. Eric Hyman (Bibble) cracked it in less than a week, and there is now public code (dcraw) that decrypts it, so the major practical effect is an unfortunate and odd quirk in our files which we think of as our digital negatives--making them that much less robust over the decades. However there is another practical implication. Adobe, in the person of Thomas Knoll, creator of Photoshop and ACR (Adobe Camera Raw), citing worries over the DMCA has said that ACR will not support the "as shot" white balance given its current encryption. As a result, each and every file shot with a D2X, particularly in Auto WB, will need to have its white balance set manually in ACR. Of course, this is presumably the kind of thing Nikon hopes will increase sales of Capture--which we all assume is why they encrypted the data in the first place. As the owner of close to 50 Nikon cameras over the last 30 years, this whole situation is getting increasingly tiring and already affects the workflow of many of us who can't use ACR yet for our D2X images. Let us know what you think! April 4: Adobe announces Photoshop CS2, featuring enhanced Raw processing, improved performance and HDR editing. Read the full press release. PS CS2 will ship in May with an expected street price of $599 and an upgrade price of $149. April 2: Nikon prepares to launch new Nikon D50 & Nikon D70s D-SLRs: After early leaks Nikon has confirmed that it is introducing a new model D-SLR, the D50. Of course since there has been no official announcement the information is all speculative, but a leaked user manual shows the D50 as being a 6MP camera with very similar specs to the D70 and uses SD cards. We can assume it will be priced very aggressively. Even less is known about the D70s, although it is expected to have a larger LCD than the D70 and an optional wired remote, but stay tuned. NOTE: People are already complaining about the use of an SD card, but frankly I think it is a nice move. Everyone except high-end D-SLR owners is falling in love with the smaller cards which are low-power and can still be built with large capacities. They are more practical for PDA interchange as well. So frankly having a prosumer model use them makes plenty of sense. For those wanting an inexpensive backup camera, shell out the $$ for the D70/S or a D2H. For first timers coming over from film, SD will be great and is more likely to interoperate with the newer point and shoots as well (My Coolpix 5200 uses SD cards, for example). March 27: Adobe leaks Photoshop CS2 (dateline April 4): "Dramatic" Raw workflow enhancements & new Vanishing Point tool are headlines. New Spot Healing Brush, for handling common photographic problems such as blemishes, red-eye, noise, blurring and lens distortion, Photoshop CS2 now allows non-destructive editing and the creation and editing of 32-Bit High Dynamic Range (HDR) images. Photoshop CS2 users will test the limits of creativity with new tools like Vanishing Point and Image Warping. The new Camera Raw 3.0 workflow allows settings for multiple raw files to be simultaneously modified. In addition batch processing of raw files, to JPEG, TIFF, DNG or PSD formats, can now be done in the background without launching the main Photoshop executable. Expect to see initial shipments in May. Adobe Photoshop CS2 will be available for an estimated street price of US$599 and licensed users of any previous version of Photoshop can upgrade for US$149. Or read the full "withdrawn" press release. March 24: DPS 3-4, Mega-pixels: The real cost of resolution--Find out how much you'll really spend when you upgrade your digicam to a new high resolution model and see what other products you may need. Plus event & trip updates & first look at the Epson P-2000. March 18: Hands on D2X review, complete with lots of images & links to full resolution JPEG & Raw images illustrating sharpness, depth of focus and high ISO shooting. All in DigitalPro Shooter 3-3, a nikondigital.org exclusive. March 18: Nikon announces availability of D2HS: Nikon has announced that the Nikon D2Hs will be available beginning March 25th. March 8: Nikon D2X / Capture Breaking News: With D2X shipments in full swing Nikon has quickly updated the initial release of Capture 4.2 with Capture 4.2.1 which is available for download for the PC & Mac. 4.2.1 adds support for the D2Hs, fixes many minor bugs, a problem where machines would freeze during batch processing and appears to be faster on the Mac. NOTE: On our Windows test machine it did not fix the memory issue we have been seeing where opening D2X NEF files consumes nearly a gigabyte of memory. February 25: Nikon D2X Breaking News: Initial production shipments have begun in Japan and Europe (sample images). Large US dealers such as Roberts expect to get their first units next week, but Samy's has already received 6. Moose has a huge set of info on the camera on his new site and Moose, along with Dave Black and John Shaw, give their impressions of their experiences with pre-production units on NikonPro. We'll have our production camera next week and will be posting plenty of additional information and images, so stay tuned. February 18: Canon Raises the Bar by Introducing an 8MP Canon Digital Rebel XT for under $1000: Finally the legendary Nikon D70 has some real competition. Canon's new Digital Rebel XT features an 8MP sensor borrowed from the Canon EOS 20-D but still keeps the price of body+lens kit under $1000. The existing model has had it's price cut giving Canon a mini-suite of 2 under-$1K D-SLRs. Without images it's hard to know whether the 8MP will matter, but you can count on lots of close scrutiny and head to head reviews between the new model and the low end products from Nikon and others. Read the full press release. February 15: Nikon announces new D2Hs: A worthy mid-life kicker for the D2H the "s" version features lots of image enhancements from the D2X, including better Auto White Balance, Matrix Metering II and image processing silicon. It also improves the buffer to 50 JPEGs or 40 Raw files, while adding support for the wireless WT-2 and adding back GPS support. However, those expecting a head-to-head competitor with the Canon 1D Mark II may be disappointed it is same 4.1MP resolution as the D2H. The Nikon D2Hs will have a suggested list price of $3499. Lots of other changes to improve the camera, including a new LBCAST II sensor and a new menu system from the D2X, which will only further improve on the D2H which for my money is already the best "handling" camera on the market. February 15: Nikon announces new Coolpix models, some with new Face-Priority AutoFocus: Nikon has announced the Coolpix 5900 and 7900, 5.1MP cameras with a new face-priority AF that actually relies on facial characteristics to help it focus. The new AF technology was developed with Identix. Nikon also introduce the Coolpix 7600, 5600, and 4600. February 14th: DigitalPro Shooter 3-2 Online: Find out the top 10 things you want to have two of to make sure your shoots are a success. Plus learn about the new 400GB drives and how to make the most of them and read our first impressions of the new Sensor Brushes from Visible Dust. Read it all in DPS 3-2. February 8th: Nikon Capture 4.2 Available: Adds support for the Nikon D2X, plus new features & bug fixes. US customers can download from Nikon USA. February 7th: Noise Ninja Plug-in Available: Noise Ninja has officially made their plug-in version for Photoshop available. NN is my favorite noise reduction tool (no, they don't pay me to say that and I bought my copy--I just like it), but I've been eagerly awaiting being able to use it within Photoshop rather than as a separate step in my workflow. You can download the trial now. An upgrade from the standalone version is $10. February 3rd: Adobe Camera Raw 2.4 has been released. It includes support for Raw files from the Canon EOS-1DS Mark II and Canon 20D among other cameras. You can download it for free. Unlike the beta, the final version does not add support for the Nikon D2X, so it looks like that will need to wait until the next release. January 25th, 2005: Photograph the wonders of Angkor Wat. Just back from an extended trip to Cambodia, Myanmar (Burma) and Thailand, I'm incredibly energized about the stunning photo opportunities and the amazing people. Read about photographing the Angkor temple complex in Siam Reap, Cambodia in DPS 3-01. January 1, 2005: Welcome to the new year. Our continued condolences for those suffering loss in the Tsunami. Relief efforts are in full swing here in Thailand. DPS reader, veteran surf photographer & friend Pete Burnight has posted some images he & a friend took of the event from the beach bar at their hotel on Phuket. Pete used his now salt-water soaked 8MP Nikon Coolpix 8400 (which he loves) for the shots as he was washed by the tsunami. The images were fine and the camera has started working again so let's hope for the best! December 29th: Did a friend get a new digital camera for Christmas? Make sure they read David's article in PC Magazine on Troubleshooting your Images to get the most out of it! December 13th: Nikon shocks the photo market with $1200 price drop on the D2H. Just in time for Christmas you can get a NIKON D2H Camera for $1999. Not everyone is thrilled though. Read what some of those who have just paid $3200 for one have to say in our Photo Tools Forum. December 9th: A big leap in monitor profiling? Read our First Look at ColorEyes Display. November 22nd: DigitalPro Shooter 2-29 is out. Find out what great Tools we use on the road--some good gift ideas--and our photo events for 2005. December 26-31: TSUNAMI: As many of you know I've been in Thailand for the past two weeks. I felt the quake here, but we were fortunately not directly in the path of the tsunamis. The tragedy has touched the entire country however, and everyone is contributing to the relief efforts in whatever way they can. I wanted to pass along a first hand Photo Story (large) from one of our readers who was on Phuket when the tsunamis hit. It may help put a face on the tragedy which is so often reported in terms of sheer and nearly incredible numbers. November 15th: Nikon D70 Digital SLR Named 'Camera of the Year' By Popular Photography -- The Nikon D70 Digital SLR was named "Camera of the Year 2004" by Popular Photography who called it "the camera that best refines or redefines photography." "For sheer technical virtuosity, there's the D70's color accuracy ... the best of any digital SLR we've ever tested," stated Pop Photo. "And its startup time -- nearly instantaneous. Plus a burst mode that gives you more than a dozen fine-quality JPEGs at 3 frames per second ... It has the look, feel and functions that have led many pros to make the D70 their backup or even primary camera." "Yet," notes the magazine, "for all the pro-caliber talk, this camera reaches out to beginners. With its program modes, extensive but easily understood menus including handholding help menus, this camera really does allow any photographer to move smoothly and painlessly into a digital SLR." October 12th: Want to know how to read your image histograms? Read David Cardinal's article, Harnessing Histograms, in the October 19th issue of PC Magazine. September 27: Adobe announces new Raw format Standard: The public standard, Digital Negative Specification (DNG), is designed to allow Raw images from digital cameras to be stored in a documented and vendor neutral way. Adobe has also shipped a free software tool to convert the images from 65 different cameras into DNG. July 3, 2004: Nikon D70 to the rescue. My D2H failed this week and had to be sent to Nikon Service. I borrowed my wife's D70. I'd used one when teaching in Yosemite, but this time I got nearly a full week with the camera. It saved my shoot. The images were stunning. I missed the vertical grip, but loved the small size & weight. At <$1000 it is a value. September 27: Adobe to announce new Raw format Standard: The public standard, Digital Negative Specification (DNG), is designed to allow Raw images from digital cameras to be stored in a documented and vendor neutral way. Adobe will also be providing a free software tool to convert the images from 65 different cameras into DNG. September 22: Microsoft moves to enhance wireless Camera experience: Microsoft & Canon announced they will be using the new Media Transfer Protocol (MTP) to simplify the transfer of images--wired and wireless--from cameras to Windows XP computers. Separately Microsoft is releasing a new PowerToy which will assist in configuring Windows XP to work with existing wireless devices such as the Nikon WT-1A. We'll let you know when the free PowerToy is available for download from Microsoft. September 21: Canon announces EOS-1Ds MkII, first 35mm D-SLR with over 16 million pixels. A worthy upgrade to the ground-breaking 1Ds, the new model is faster at 4fps, higher-resolution at16.7MP, will shoot at up to ISO 3200, and features a larger (32JPEG, 11Raw) buffer. Canon has also introduced a WiFi option, the WTF-E1 which will support 802.11b/g. Like the 1Ds, the camera will be priced at $8,000. How will this affect your photography or camera buying plans? Let us know in our Photo Tools forum. Raw+JPEG, Is it for you? Update on our Monterey trip, all in DPS2-26. August 19th: Canon 20D Announced: 8.25MP, 5fps, 1/250 flash sync, E-TTL II flash technology, DIGIC II with fast turn-on, plus weight reduction from the 10D. Looks like a winning model in the "10D/D100" space. Shipments to begin in September at about $1499 for camera body only. A new vertical grip, the BG-E2 was also announced. Same sensor size as the 10D, with a 1.6x multiplier. Click here for the full announcement. August 9th: Intro to Image Cataloging (DPS issue 2-25). How to get started with cataloging your images & tips on using new features in DigitalPro3 to help. Plus announcing our Monterey Bay Photo Safari in October. August 2nd: Considering Raw? Read David's article Photos in the Raw in the August 17th issue of PC Magazine. You'll learn the pros and cons of switching to Raw for your image captures. July 8th: DPS 2-24: Featuring Customer Service, Photographer Style and some cool new product announcements is now online. June 19, 2004: FATHER'S DAY PRESENT? Nikon ships the SB-600, but is it such a good deal? I've been eagerly awaiting an SB-600 as a wireless slave for my SB-800 after being assured at PMA that it would be the same unit without the master functionality. It's now shipping, and is nearly $100 cheaper than the 800, but it appears it is only 3/4 of the power, at a GN of 90'/30m vs 125'/38m. If you don't need matching flashes or don't need the master capability at all, it's a good way to go at around $250 street, but if you need to have full power for your second flash you'll need to buy a second SB-800 for around $335. June 18, 2004: Nikon fixes Caption problem in Capture and improves Capture performance, with Capture 4.1.2 for Windows and Mac. A must have for Capture users bedeviled with IPTC compatibility issues. June 12, 2004: All the storage you'll ever need? Probably not, but LaCie now sells a 1-Terabyte external hard drive. At $1200, it is down near that magical $1/GB price performance level. If you get one though, you'll probably need two. How else would you back it up! May 28, 2004: Nikon releases a killer action lens combo. Nikon today introduced a new generation of its 200f/2 lens--this one with AF-S--and a brand new 1.7x Teleconverter. On a D-SLR the combo is a lightweight 500f/3.5! We're happy to see the venerable 200f/2, previously only available in a manual focus version, updated as a great alternative for those needing a long, fast prime lens. May 24, 2004: DPS 2-23: Older & Lighter. Some thoughts on doing more with lighter gear. May 17, 2004: Lexar to provide Kodak Brand memory products: Kodak & Lexar announced that Lexar Media will manufacture and distribute a full range of KODAK branded memory cards. In short, Lexar will make all of Kodaks flash cards and other camera memory products. Both companies will market the products worldwide. May 15, 2004: Delkin announces a USB Bridge--Allows you to connect your D-SLR or other USB device directly to a storage device without a computer. Expected to ship in June with a list price of $69. April 24, 2004: Adobe releases Camera Raw 2.2 with Nikon D70 and Coolpix 8700 support. Windows version & Mac version available. April 23, 2004: Digital shooters as scofflaws? A tiny company is suing to enforce a compression patent against companies using JPEG. They've settled with Sony for $16M, but are suing 31 other computer companies including Apple, Dell and HP. See why Forgent thinks it can make us all pay. April 18, 2004: Fly Secure! New TSA-Approved locks let you secure your baggage. Either a Lewis N. Clark TSA 4 Dial Combination Lock or Lewis N. Clark TSA 3-dial Combo Lock/2 pack will do the job. Note: These are not 100% foolproof. Some TSA folks apparently don't have keys and are still cutting locks, but to me it's worth the risk vs. not locking at all. March 30, 2004: The perfect gift for that friend or relative just getting started with digital photography. Peter Burian's book, Mastering Digital Photography, is a fast-paced survey of all the topics they'll need to know about from choosing a camera to getting accurate color prints. It's sure to save you having to answer dozens of questions as they get started. Feb 27, 2004: Nikon prepared to blow the doors off the D-SLR market for 2004. After missing revenue numbers in the Christmas season due partially to product shortages, Nikon is planning to make up for it in a big way. Nikon is prepared to ship 800,000 D70s in the first year according to Nikon Thailand's President, Kenichi Kanazawa--more than the entire world-wide industry's D-SLR shipments of 765,000 in 2003 and 10% of Nikon's projected 8 million digital cameras in 2004. Clearly the switch to digital at the high-end of the market--pros and advanced amateurs (aka "prosumers") has begun in earnest. Adobe releases Camera Raw Update--Including D2H support! Feb 11: Pre-PMA: Digital is the word! Plasma screens outnumber photo posters, almost the only film cameras are disposable, and Microsoft has a booth--with a Pro Corner where you can get a demo of DigitalPro for Windows--and the word photography has subtly been replaced by the word imaging almost everyone. All signs that digital has arrived for the pro photo marketplace. December 8, 2003: PhotoRescue 2 is now available. Faster, supports large drives, can recover images on FAT32 cards. Get it now before the price goes up to $39! Another "tax" to Redmond? Microsoft, effectively immediately, is charging makers of digital film cards $.25/card to ship them pre-formatted with FAT. Hopefully they will not start charging photographers a fee for each time they reformat them:-) They want $.25 for every camera also. Feb 11: Foveon designed into Polaroid x530: In a key win for Foveon the new Polaroid x530 will use a Foveon X3 4.5MP (1.5 million x 3 sensor). Perhaps more importantly this will be the first X3 camera which generates JPEGs in camera. If the image quality is good that represents a major advance for Foveon. Scheduled to ship in June, the x530 will have an MSRP of $399, bringing Foveon technology within reach of the point and shoot consumer. Feb 9: WRP Announces MP-3/MP-3c packs: Another well-thought out pack from Moose Peterson and WRP. The MP-3 is smaller than the MP-1 and designed for photojournalists, sports shooters, and other working photographers who may also need to carry a laptop. You can learn more as well as order the pack which will start shipping at the end of the month. Feb 9: Simpletech announces 8GigaByte CompactFlash card. Plenty of storage for even the most demanding shoot. Not cheap, but expect this to be the first of a wave of larger cards which will continue to drive prices down for smaller cards. 2GB-5GB cards, all with 10MB/sec write speeds were also introduced. Read the details. Jan 28: Canon announces the 1D Mark II at $4500 MSRP: 8MP and 8.5FPS successor to the 1D. That makes it the highest resolution action D-SLR in the world, and the fastest high-resolution D-SLR in the world! Expect it to be shown at PMA. The Mark II will also feature improved "E-TTL" flash, and a 40 JPEG or 20 RAW image buffer. From the specs this is a winning upgrade to the 1D, although with a hefty price tag--perhaps influenced a little by the declining dollar. Jan 28: Nikon announces details of the D70. An impressive 6MP D-SLR with 1/500 flash sync, 3fps, a new CCD, light weight and small size. For those not needing the MB100 grip, the D70 looks like a very cost effective alternative to the D100 or 10D. Nikon also touts nearly no shutter lag and instant on. All in all, a solid upgrade from the D100 except for the loss of a vertical grip option. Jan 28: Nikon enters digital wallet market with the COOLWALKER MSV01--30GB portable storage device with integrated image preview display. Very cool for those needing mobile image storage and viewing! Jan 28: Nikon announces new 8MB Coolpix 8700 ZLR and the SB600, smaller companion to SB800 flash. This information is not confirmed by Canon, but is from a fairly reliable source. We'll post more details as they are confirmed. Do you need 8+8 in your camera? Let us know in our Photo Tools forum. Jan 20, 2004: Frustrated with your PC or your vendor's poor tech support? Building one may be easier than you think: DPS 2-19 is all about how to get started building your own PC. I've built my own machines for years, but have hesitated to recommend it since it's possible to make a complete hash of things, but online resources get better and the components get smarter each year. If you have built your own machine or are thinking about it, share your experiences with us in our hardware forum. Jan 14, 2004: A new SPEED King! Lexar has long been the CompactFlash speed king. With the 60x 1GB EXTREME card, Sandisk is now the performance champion. With transfer rates of over 10MB per second (given an optimal PC or Mac), the card is blazing. Available for as little as $329 at B&H. Moose reminds me that this speed won't help your D1 or D2 shoot faster, as they are limited to about 32x, but it will improve your upload times if your PC & reader are fast enough. Jan 5, 2004: All about Color! Wish you knew more about how your camera reproduces color? Confused by all those tips that tell you how to get the most out of your camera's color? Read DPS 2-18: All about Color for the essentials of how camera color works, what problems it has, and what you can do about them. Jan 3, 2004: Redder reds? It appears that the D2H has a similar red cutoff to the D1, giving it some of the same nasty reds. One trick is to place a Tiffen Hot Mirror filter on your lens to cut the near-IR light back out. Of course Nikon has balanced the camera and NC4 to work with the sensor the way it is, so watch out for other possible side-effects if you go this route to fix your reds. Share your experiences. PMA Wireless? We were happy to read that PMA will have 802.11b WiFi availalbe. What a relief after years of bad cell phone signals and running to the hotel to get email. But wait--They'll be charging $25/day for it. That's got to be more of a rip-off than car rental insurance. Too bad. Let us hear your opinion by sounding off in our Photo business forum. 12/3/03: Nikon pre-announces the D70. Well, they call it an announcement, but except for saying it will be an F-mount digital with a DX lens designed to accompany it, and that they will ship in Spring, they aren't saying anything else publicly. The obvious assumption is that it is a sub-$1K camera designed to compete with the Canon 300D (Digital Rebel). I'm sure we'll be hearing more about it and hopefully seeing it at PMA. A coincidence? The Canon Digital Rebel (300D) is now being discounted $50 for the kit or body only by online retailers like Amazon. Jan 1, 2004: 40x for $.25/MB?! You can get a 1GB 40X Ultra CompactFlash Card from J&R for $249. If you don't need the speed, the 1GB CompactFlash is only $219. The trick with buying film cards seems to be to wait as long as possible to get the best price, but not so long you're stuck without them when you need them. If you need a card now, these are great deals. If you'd rather get a 2GB or 4GB card, I'd wait and watch as prices continue to come down. December 4, 2003: Flash Card price crash looming? Good news for those upgrading to higher-resolution cameras. The computer industry has responded to the growing demand for digital memory by increasing capacity. This is resulting in increased supply and resulting price pressure and rebate programs. 11/26/03: Canon has discontinued the 1D. No word on the replacement, but with the D2H shipping and a new Canon on the way, digital shooters have never had more or better options. Also Nikon rebates on film bodies and many of their lenses. Check with your dealer for specifics. Learn all about the D1, D1X and D1H in The D1 Generation .Written by Moose Peterson and David Cardinal, this book explains how to shoot with, get the most of, and understand all there is about digital capture with these 3 bodies. The book’s 266pgs tell all! Put the power of digital capture to work for your photography! "In this book, Moose & David bring the practical together with the technical to make a most useful book. It is great to see a digital camera book done by a real photographer who has truly used the equipment in the field. Moose & David give you tips that you know are based on real-world experience." October 24th: Bringing affordable ICC color management another step closer for many photographers, Colorvision has cut prices on many of their color management offerings. We don't have them here for review yet, but wanted to make sure everyone knew that the cost of good color management has come down another notch. October 17th: This must be gadget week. Apple & Belkin have now announced a $99 adapter that will let you use your iPod (if it is a newer model with a dock connector) for digital photo storage direct from your digital film. You will be able to buy it directly from Belkin when it is available. I haven't seen it or used it, but if you do, please share your experiences in the Hardware forum! October 16th: FAST PC Card adapter from Delkin. Speed up the last really lame link in your digital shooting. Delkin is now selling a full 32-bit PC Card adapter for CompactFlash that makes downloading your images into your laptop a snappy proposition. Read about our experience with it in DPS 2-14. September 30th: Photoshop 8 (Photoshop CS): Activation? Is it for you? One of the most controversial 'features' in the new PS is activation. Learn how it works and whether it is right for you before you upgrade. September 29th: Kodak has slashed its dividend to fund aggressive plans in digital imaging. Will it work? Read our analysis in DPS 2-13. September 11th: DPS 2-12 on the Future of Cameras: Beyond Mega-pixels. September 1st: Fall Color Seminar & Day Shoot in Michigan--October 10th and 11th, plus other upcoming photo events for Fall 2003 and 2004. August 29th: Storage Update: Maxtor has broken the $1/GByte barrier for add-on external storage. Their new One Touch drive line features capacities from 120GB to 300GB, with the 200GB Firewire/USB drive selling for $199 with included backup software. So now, even folks who don't want to construct their own enclosures can have nearly unlimited storage at a great value. PC Magazine has a full review. August 20th: Canon breaks the $1,000 price barrier for D-SLRs. The new Canon Digital Rebel, with a 6.3MP sensor is expected to sell for $899 when it is available in September. A $999 bundle includes a new digital-optimized 18-55mm lens. This could be the camera that opens the floodgates for film holdouts to cut over to digital. We don't have a unit to review yet, but you can read the specs in the meantime. With many components and features in common with the higher end 10D, the Digital Rebel may also appeal as a backup or travel camera to higher-end and professional photographers. August 18th: Updated PhotoRescue for Windows and Mac. The demo version will now restore non-image files For Free, and the new version includes some fixes for Canon Raw (.CRW) files. Learn more or download an evaluation version. August 10th: Digital Storage Special Issue of DigitalPro Shooter. Lots of what you need to know about taking care of your digital images once you've captured them. July 30th: Free Storage? Not quite, but with recent price drops you can now expand the disk storage on your PC or Mac for about the same cost as burning to CD! Some ideas for expanding your online photo storage. July 22nd: Early Christmas? Love it or hate it?! Nikon's "H" in the hole: Nikon's new D2H draws a line in the sand by being a no-compromise high-performance D-SLR while at the same time flaunting the traditional race for more pixels. Read how the new camera may change the way you shoot, as well as details on new Nikon lenses & flash. July 14th: Is the new Nikon 12-24DX really the killer ultra-wide digital shooters have been waiting for? Read Moose's exclusive review and find out! He'll also tell you whether it worked out on his film camera. June 1st: Moose reviews the cool new Fortress for secure backup of your images while you're away from the office. May 22nd: Another Lexar Firmware glitch: If you have an early Lexar 32x or 40x Pro card and use it with your D1X or D1H, you may need a firmware upgrade to ensure you don't get the deadly "CHA" error and need to save your images with a program like PhotoRescue. If the last 4-digits of your serial number are OE1B, you're okay, otherwise contact Lexar to see if you need the fix. May 22th: Nikon will begin shipping new D1X cameras with the larger buffer and a coupon for Nikon Capture. Still working on getting specifics for when the new shipments will start. May 9th: Looking forward to rain? David reviews the new Aquatech SportShield rain cover. See if you'll be looking forward to the rain too! May 8th: Of interest to wildlife shooters, Sibley's now comes in pocket guides for the Eastern & Western regions of the US. A must for any serious birder or bird photographer to use while in the field. You can buy them through the Birding Books section of our bookstore. May 5th: Update on EN-4 replacements from North American Battery: The Polaroid brand replacement for the Nikon EN-4 is model PR114DG. This battery is available from Batteries Plus stores or can be ordered by phone from DC Power, (800) 209-0109, ask for Pat Cave. For anyone that purchased the battery with the defective end cap, a free replacement will be mailed to you by emailing stephen.provost@nabcorp.com . Please include your name, address, and quantity of batteries that you purchased, that you need replacement caps for. Note: Users have also been able to order them from other distributors such as efunctional.com. The good news is that NAB is now shipping the redesigned units & EN-4 replacements can once again be had for under $50! April 4th: David reviews the Canon EOS 10D. Find out if it is the D100-killer that many Canon shooters claim it is! April 4th: Joe McDonald joins other nature pros including John Shaw, Moose Peterson and Daniel Cox in using and recommending DigitalPro2 for their image management needs. Read Joe's review or head straight to the DigitalPro2 website. March 31st: Nikon has lowered prices on all its D-SLRs. A quick check of online dealers showed that some like B&H appear to have incorporated some of the new prices [D100 $1700, D1H $3350, $D1X $3900] while others like Robert's [D100 $2000, D1H $3650, D1X $4650] haven't yet. So if you're planning to buy soon, make sure you get the benefit of any repricing. The new price on the D100 brings it within striking distance of the $1500 street price on the Canon 10D. March 26th: Nikon View 6 available for download. Moose's review of the new Nikon 70-200 AF-S VR. March 25th: New versions of Photorescue are available for Windows & Mac OS X. They feature support for new Nikon & Canon cameras, enhanced support for 1GB cards, and Olympus Raw files, plus Mac help files & a new Mac installer. If you are a new user, you can download a free Evaluation version here. If you are a registered user, you can use the online updater. If you don't have Photorescue, learn why you probably should! March 24th: MSN has reprinted our DigitalPro Shooter article on Getting Great Photos, with some additional sample images. March 24th: Curious about Raw files and whether you need them? Read Raw vs. JPEG, Style or Substance? in DigitalPro Shooter 2-7, and let us know your thoughts in the DigitalPro Forums. March 17th: DigitalPro Shooter 2-6 takes you through 10 strategies for when your hard disk fills up. We also added a Birds & Birding section to the DigitalPro bookstore. March 4th: Read our PMA round-up in DPS 2-5. Also: EN-4 Replacement update: NAB, makers of the Polaroid EN-4 replacement have confirmed that they have fixed the problem with the end caps and expect to be shipping the fixed batteries in about 2 weeks. They will replace defective end-caps through their warranty department starting about the same time. We suggested they make extra end-caps to make sure they could fill requests, and they agreed that was a good idea. Hats off to them for dealing with this issue in a timely and effective manner! March 2nd: Lexar introduces 32x 2GB & 4GB cards! In particular, the 2GB Type I card with an expected price of $699 and availability in March will likely be of interest to Raw file shooters looking for the largest fast, affordable card they can find. NEW: Canon 10D! February 27th: Canon today introduces the much-rumored replacement for the D60. The new Canon EOS 10D is a very solid upgrade from the D60. Only real shooting will tell, but from the specs, this is a very well thought out and very solid upgrade to the D60. For more detail read the full article. February 25th: Lexar introduces 40x cards, plus faster 1GB cards. Cards will be shown at PMA and are expected to ship in March. Estimated retail will be $140 for the 256MB and $240 for the 512MB 40x cards, and $400 for the 1GB Type 1 32x card. If you're looking to speed up your shooting or card downloading, these should be a great tool. For more info. February 19th: One stop shopping for raw files? Adobe has released their long awaited Camera Raw plug-in for Raw files from Nikon, Canon, Olympus, Minolta and Fuji. You can read the user's guide online or purchase from Adobe for immediate download for $99. We'll have a more complete review soon, but from an initial session with it, it is a very slick alternative to Capture or the Canon raw converter. It replaces the Nikon NEF plug-in, but provides all the control you need for opening your image right in the dialog box. You can save image settings, and then resulting quality was stunning on the images we've tried so far. It works seamlessly with DigitalPro and DigitalPro2--just set your NEF editor to Photoshop and CameraRaw will be invoked when you go to Edit a Raw file. The ultimate reference book on Color Management? Bruce Fraser has teamed up with Chris Murphy and Fred Bunting to create Real World Color Management. See DPS 2-4 for a full review, but in short it is the single best overall reference for those wanting to learn more about a color managed workflow. It complements the nitty-gritty style of Dan Margulis's Professional Photoshop: The Classic Guide to Color Correction, which focuses more on the specific issues of image correction. February 17th: Nikon releases Capture 3.5.1 with fixes for white balance problems. Windows version and Mac version available. February 17th: Pixim introduces the Digital Pixel System. Read about it first in DPS 2-4: Digital Pixel System from Pixim, Real World Color Management. NEW: DigitalPro2 -- The fastest way to work with your digital images is now faster and more powerful than ever. Pro Shooters is pleased to announce the immediate availability of DigitalPro 2. Exclusive online videos of DP2 and licensing at the WRP DigitalPro page! Nikon-compatible batteries for less?! North American Battery makes a replacement for the EN-4 under the Polaroid brand name, which we've found for as little as $49.31. They're 2100mAH (should be as good or better than the Nikon 2000mAH). January 16th, 2003: NEW: Camera profiling with ColorEyes from Integrated Color. Is this finally the usable camera profiling software we have all been waiting for? Read David's review and find out. January 6th, 2003: NEW: Happy New Year! Our Top 10 Tips on how to improve your photography for 2003. Plus, Moose has announced his 2003 safari schedule and David has announced he'll be leading a Grizzly Bear & Puffin trip in July. January 6th, 2003: Rumors are beginning to circulate that Adobe Photoshop 8 will be released this year, featuring improved 16-bit support and handling of non-square pixels. Perhaps the pre-announced Adobe Raw file plug-in combined with PS8 will allow native editing of D1X Raw files? December 18th: Capture One D-SLR Raw file processor from PhaseOne is now available for purchase on their website. For Canon shooters, it is a very attractive Raw file processing option. December 16th: All fixed:, My D1X came back with the 5.01 fix today... Nikon received it Friday and sent it out the same day via overnight. Cool! Too early to tell for sure if it is completely happy, but test firing long bursts hasn't revealed any damaged images, so far so good. Make sure and check your camera for dust on return. I don't think it is anything Nikon does, but shipping these bodies seems to redistribute whatever material is in there, sometimes landing it on your CCD/filter. The best news, With Lexar WA cards and the 5.0x firmware, the camera writes really fast! Moose will have a review of the cards for us soon, so stay tuned. December 15th: Nikon USA has quietly gotten back into the online support business. Their new online Digital Knowledge Base and notification system is an excellent new resource for Nikon Digital shooters. With over 314 tips, answers, documents and drivers (so far) the site is a well organized and well thought out support option for those looking for answers to common questions. In addition to reviewing the tips that are there, you can also ask Nikon USA a question or ask to be notified when new articles are posted related to your equipment. It is not a true 2-way BBS, so you can't have discussions with others. For that of course we highly recommend our own DigitalPro Forums!, but for getting the official word on your equipment from Nikon, it a welcome new web site. Thanks, Nikon! December 13th: NEW: Photorescue Build 634. Improved thumbnailing and raw image recovery, along with other new features. Registered users can get a free upgrade from Photorescue and new users can download a full functioning trial version here. Plus: Cardwiper has been updated to 1.0.1. You can also download it here. November 28th: Nikon Capture 3.5 update available for download. Allows for storage of larger previews in Raw files, vignette control, etc. I'll be posting more on NC35 after I've had a chance to work with it in the field. November 22nd: One of the first full reviews of a true production Canon EOS-1Ds. See why David found it an incredibly sweet camera. But will you want one for $8K? January 9th, 2003: Kodak's 14n rumored delayed until March, while Canon appears to be discontinuing the D60 to make room for a new model--perhaps a full-frame D90 to be introduced at PMA? Lexar brings out a 40x JumpDrive, so we expect to see 40x DigitalFilm cards before too long. December 10th: Nikon has quietly started recalling all D1X buffer upgrades. Version 5.00 of D1X firmware has a bug which causes a small defect in the upper-left corner of your images. If you have purchased the Buffer Enhancement for your D1X and it shows version 5.00 of the firmware, you should be receiving a box & UPS shipping label from Nikon offering you the chance to return the camera to them for a further upgrade to firmware 5.01. How serious is it? On my upgraded camera about 3%-4% of the images have the defect, an annoying 'stripe' along the top left of the image. You can see the defect for yourself in this down-sampled D1X image of a Sandhill Crane. November 18th: NEW: Nikon changes firmware upgrade location. As of the 20th, Nikon has changed the firmware upgrade location for the D1X and D1H back to their usual service centers. Cameras will be forwarded from Kentucky to a service center, but for fastest turnaround make sure and double check that you're sending your camera to the right place! Read DPS1-17 for a full report on Moose's and my experiences & results from buffer & firmware upgrades. November 18th: The Leonids are tonight. If you've never photographed them before, it is fun and its possible to do with your D-SLR--although a little bit of a struggle dealing with long exposure noise. For a look at a photo I took last year, see Moose's review of the Digital Camera Battery. As far as settings, I plan to use D1X tethered with NC3, NEF (my one time all year:-), and probably ISO400 with consecutive 25 second exposures. October 7th: Nikon unleashes a volley of upgrades: D1X, D1H, D100 firmware, Nikon Capture 3.5, and a memory upgrade for the D1X. You can read all the details & what they mean for you in a special issue of DigitalPro Shooter: DPS 1-15: Nikon D1X, D1H, D100 and Capture Upgrades. October 1st: VERY COOL: Nikon has released a new firmware upgrade (1.7) for the CP5000, which greatly reduces the shutter lag and adds Raw mode. Thanks to our Moose-sleuth, our readers not only know to download the firmware, but to get it from the European link, as the US version appears to temporarily be a corrupted download. August 27th: NEW: Read Vividlight's new review of DigitalPro for Windows! August 22nd: NEW: DigitalPro 1.5 for Windows is released and available for download. Now the fastest way to work with your images is also the first fully color-managed solution for digital photographers! August 22nd: Moose reviews the new Nikon 24-85 AF-S. Find out whether he likes this tiny version more than his 28-70 AF-S! July 15th: NEW: Read David's article in the August issue of PC Magazine "Beyond Point and Shoot" on moving from film to digital. If you're considering moving to digital this is a must read. If you've already moved you might still find a couple helpful tips. July 10th: Moose's hands-on review of the D100 after 3 weeks of shooting. Plenty of good info and images! April 11th: Announcing DigitalPro Shooter Forums. Forums for and by folks who are serious about digital photography! For biographies of our all-star cast of moderators, see DPS 1-8. February 16th: David's Photoshop tips for Photographers, in DigitalPro Shooter Issue #5. February 7th, 2002: Bothered by how much work it is to take a few off-the-cuff shots with your Pro digital gear? Does it turn your off-hours shooting from fun to work? David's got some helpful tips on simplifying your shooting and workflow for casual occasions. Speed or Space? : Not all hard drives are created equal. Maxtor, for example, offers an external Firewire 300GB 5400RPM drive for slightly more than the faster but smaller 250GB 7200RPM drive. Both great products, but which one is right for you will depend on your budget & storage needs. Either way, one of the coolest features of the "OneTouch" drives is that if you get two, you can back up from one to the other with--One Touch.